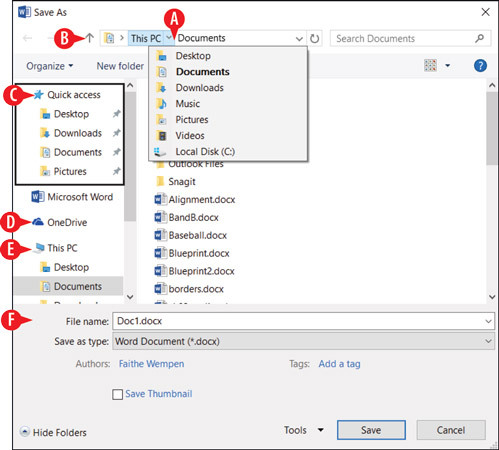 Office 2016 uses the current Windows user’s OneDrive as the default storage location. OneDrive is a secure online storage area hosted by Microsoft. Anyone who registers for the service, or who logs into Windows 8 or later with a Microsoft ID, is given a certain amount of free storage space, and can purchase more. You can also save your files locally, where the default location is your Documents personal folder. In Windows, each user has his or her own separate Documents folder (based on who is logged in to Windows at the moment). When you change the save location, you’re changing to a different path for the file. You do that by navigating through the file system via the Save As dialog box. The Save As dialog box provides several ways of navigating, so you can pick the one you like best. Here are some ways of changing the location in the Save As or Open dialog box. Use the controls in the Save As or Open dialog box to change locations. Click one of the right arrows in the address bar to open a menu of locations. Click the Up One Level arrow to go up one level in the folder hierarchy. The Quick access list holds shortcuts to commonly used locations; you can place your own favorite locations here too by dragging them here. To browse your OneDrive from the top level, click OneDrive. To browse the local PC from the top level, click This PC. Click a location in the navigation pane to jump to that location.